Don't Be Hatin': How To Make Good With Your Best Friends New Girl | PrimeYours! There are lots of reasons why friendships between men break up – disagreements over money, loyalty or trust issues, or lifestyle choices. The worst thing to end a friendship with a buddy over, however, is a woman. Yet it seems to happen all the time. If a guy gets a controlling woman in his life and the two of you do not get along, eventually he is going to be forced to make a choice and chances are – it will be her over you. So what’s the key to liking your best friend’s girlfriend, and maintaining your friendship? The first impression you have on the new woman in your friend’s life, and the impression she has on you, could make or break your relationship. Meeting someone new means putting your best foot forward. Even if you have an immediate dislike for her, it is important to make an effort to be friendly. If you have a bad reaction to her that is obvious, you will plant the seed in her head that you do not like her, and your best buddy will have to endure the consequences. The next thing you know, he will be avoiding social outings and not returning your calls. So even if the sound of her voice makes you want to pull your hair out, or she is copping some serious girlfriend attitude in your direction, be the bigger person and make nice the best you can. You will also have to be somewhat understanding of the new relationship. Couples who meet and fall in love generally like to spend lots of time together – both in the bedroom and outside of it. Give your friend and his new girl some leeway as they kick start their relationship, even though he may be cancelling out on his guy dates with you. Once they make it through the initial months of passion, he will return to some sort of reasonable schedule and you’ll be back on the roster. 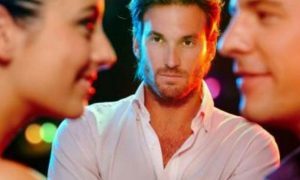 Beyond the first impression you and your buddy’s new woman share, and his new schedule of ‘girlfriend’ time there are three main things that are most likely to get in the way of your relationship with her: jealousy, feelings and secrets. If you are feeling angry or resentful towards the new woman, your best friend or both, consider why exactly you are feeling that way. Is it because you are jealous and want a relationship of your own? Or if you are already in a relationship, is it because you are essentially unhappy with it and want something more like they have? Remember that all couples are different. Some display affection and love outwardly and constantly, while others are more discreet. It may take some getting used to if your best friend is always pawing at his woman, or she is always doting on him, but try to be understanding. If he seems happy with the new relationship, you should be as well. In the case where you suspect he has fallen haphazardly head over heels, there is little you can do. Warning him that the new girl might not be worthy of such devotion, could end your relationship with him instead. You must let their encounter run its course, and try to be there for him no matter which way it ends. Another reason why you might be feeling negative vibes towards the girl is because you are denying a secret crush on her. Remember in kindergarten when you were always mean to the girl in the class that you liked the most? This is the same situation. It is always hard to have feelings for someone that can go nowhere due to circumstances. At the same time, sometimes you cannot turn true feelings for someone off very easily. Try to maintain perspective on the situation. Even if you think your buddy’s new girlfriend is, in fact, the woman of your dreams – you must contain those feelings the best that you can. As they say, there are plenty of fish in the sea. Chances are, she might have a cool girlfriend for you, or your crush will dissipate as you become better friends with her. It is important to maintain good friendships with woman – it will always benefit your relationships with them in the end. The third thing that is most likely to get in the way of your good relations with your buddy’s new girl are secrets. This happens more than most people know. You might be harbouring a secret about your best friend that is getting in the way of your good relationship with the new girl. Does he trash talk her when she is not around, and then shift gears to Mr. nice guy as soon as she steps in the room? Has he confided in you about any secret relations he is having with another woman or several? It is always hard to keep your friends secrets, but it is essential. Unless you have serious knowledge of something that could ultimately threaten your buddy’s girl, i.e. unsafe sexual practises, you must keep those secrets in the vault. If you happen to stumble across secrets of hers, you are in an even greater predicament. Maybe you know that she has been up to no good with other guys, or that her intentions for your friend on not in his best interests. By telling him, you will risk him believing her story over yours, and this could put a permanent rift in your relationship. Unless the secret is so dire that it is worth risking your relationship with him as well as hers, keep your mouth shut. Chances are the truth will come out in the end. If you managed to avoid all the pitfalls of a bad relationship with your buddy’s new girl, you will all be better off in the end. Good friends are hard to find, so put your best foot forward when it comes to forming bonds with both sides of the partnership. Some say the rule goes “lovers come and go but friends will always remain the same.” The time will come when you will need your best buddy to be supportive of your relationship with a woman, so always put your best foot forward, no matter what the situation may be. In the end, when it comes to liking your best friend’s girl, the best rule is… don’t be hatin’.